Do you remember when you had 5-10min b/w classes where you got up, moved around or walked to your next class? Do you remember how it served as a wake up and refreshed you mentally? Do you build in these 5-10min breaks every hour just to stand up and get loose, get the blood moving and get yourself feeling good? Here’s what I like to do. When I know I’ll be working at my computer / desk for a while, I set my stop watch for 15, 25, 50 or 55min to work on a task and then when it chimes I stand up. If it’s a shorter time, like the 15 min interval, I just stand up. If it’s the longer time, say the 55min interval I’ll refill my water glass, use the restroom, stretch or do some pull ups, push ups, a plank circuit or movement prep. Whatever my body needs at the time or whatever goal I’m working on that day. I proposed this idea to my clients and some of them say they can do the stand up, get the water, use the restroom and some light stretching, but most say they can’t do lower body stretching or exercises because of how they’re dressed or where they work. I thought about this for a while and I decided 2 things: 1) I’d show you how to stretch your whole body if you were wearing a suit or skirt. 2) if your concern for your work environment is b/c other people are there, get over it. Either you’re a leader and you do beneficial things 1st that other people are afraid to do or might even laugh, whisper and point fingers at you for, or you continue feeling so-so and wait until someone with courage, who doesn’t care what other people think, does it. Did I ruffle your feathers? 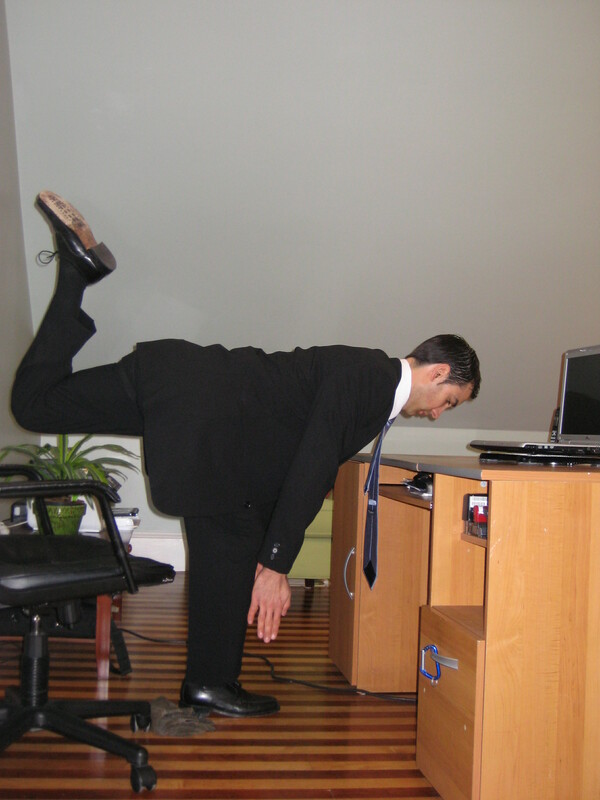 I hope so, b/c you’re about to increase your blood flow by following this 5 minute office stretch routine. (really it’s only 5-minutes and it’s a follow along circuit). If you liked this video, feel free to share it, comment on it or like it. 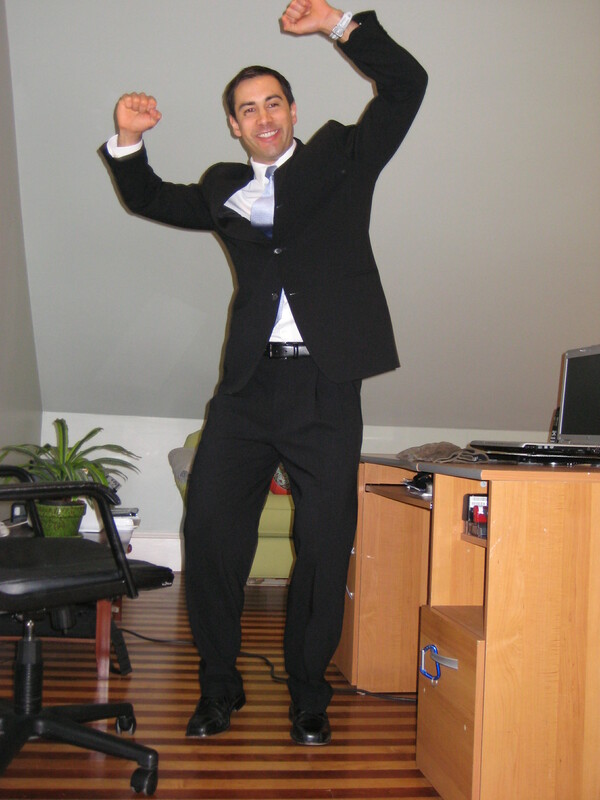 If we receive 100 comments, I’ll make a 5 Minute Office Workout you can do in a suit. We might need props though. Have you seen my stapler? p.s. comment below if you liked it or did it. p.p.s. if I’ve helped you in anyway at any time please vote me best personal trainer (a.k.a. coach). click here. p.p.p.s. if you got into your best shape, changed your body or transformed your life, please vote us best boot camp (a.k.a. program). click here.